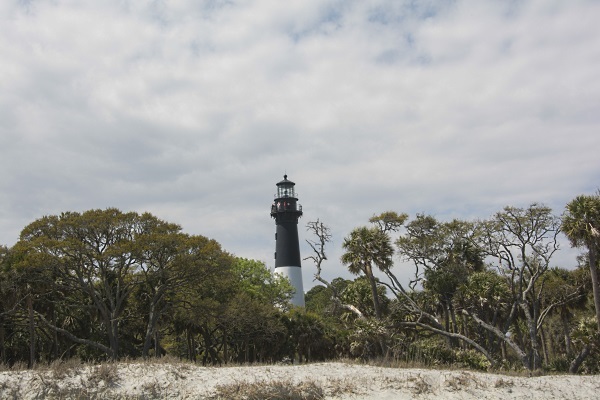 Trip Location: Nature Trail, Beach and Lighthouse at Hunting Island State Park - April and November of 2014. 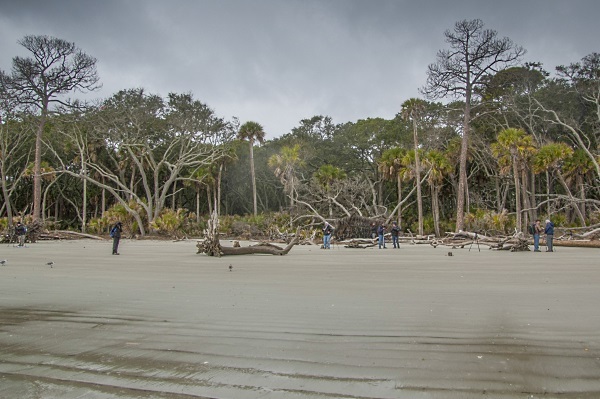 Trip Mission: Participate in a volunteer-led photo walk and discover some of the key spots to look for wildlife and other scenic photo opportunities at Hunting Island, while getting tips on shooting better photographs from a pair of experienced photographers. Trip Difficulty Rating: Easy - no experience is necessary and the walks are conducted on well-marked trails. Some basic familiarity with the camera you are using would be helpful to getting the most from the trip. 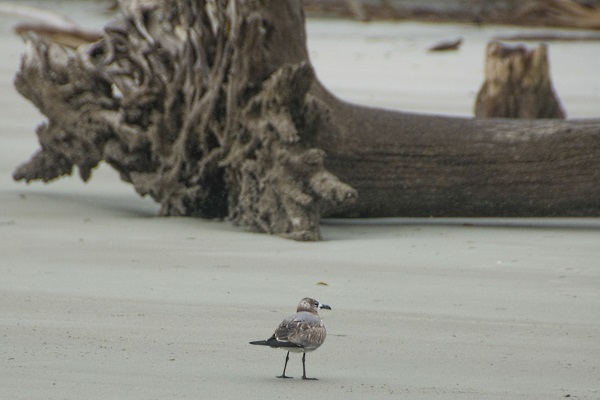 If You Go: These photo walks are scheduled about a month in advance to coordinate with low tide (to facilitate shooting at the popular driftwood beach) and with other park activities. 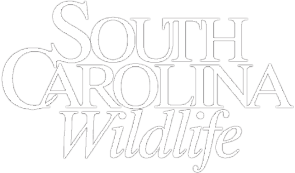 Visit southcarolinaparks.com/hunting-island and review the monthly program calendar for upcoming walks, or e-mail David Price at photobug@pbiphoto.com for more information. 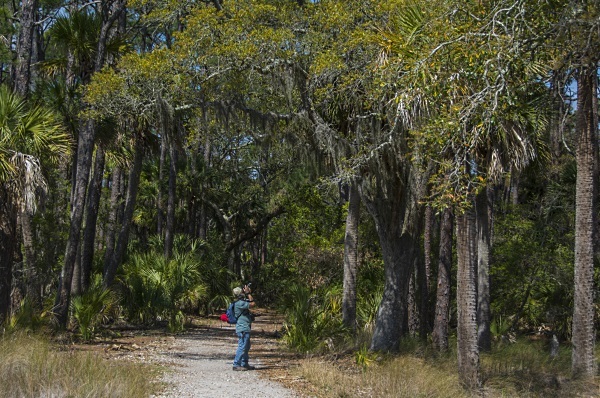 The photo walks are free with paid admission to the park. 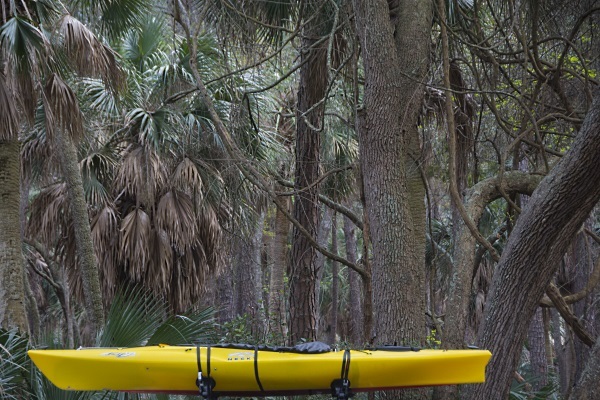 On a pleasant Lowcountry Saturday morning last April, my wife and I pulled into the parking lot of the nature center at Hunting Island State Park near Beaufort. 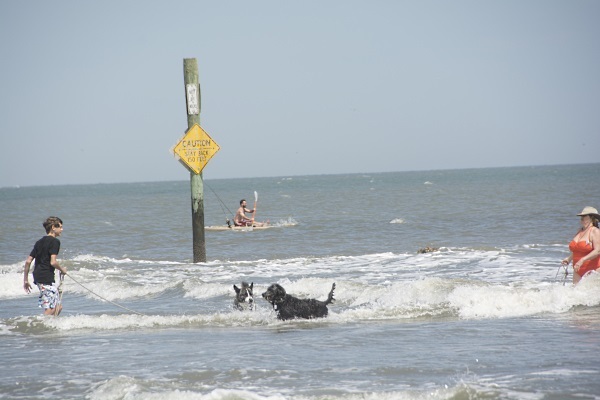 We visit Hunting Island frequently - it's one of our favorite places - but today's agenda was different than our usual routine of beach walking and sunbathing. On this visit, we were taking advantage of a relatively new volunteer-driven program at HISP designed to help amateur photographers gain some new skills, organized by a friendly couple with quite a few years of experience in photography between them. "Amateur" is a pretty good description of my photography skills (or lack thereof) so this particular trip seemed right up my alley. "I went out to California on a six month job assignment and ended up staying 19 years," laughs Aiken resident David Price. Price is a slim, easy-going man with a ready smile. He and his wife, Lyn are both longtime photographers with considerable skills, and they enjoy sharing their hobby with others. 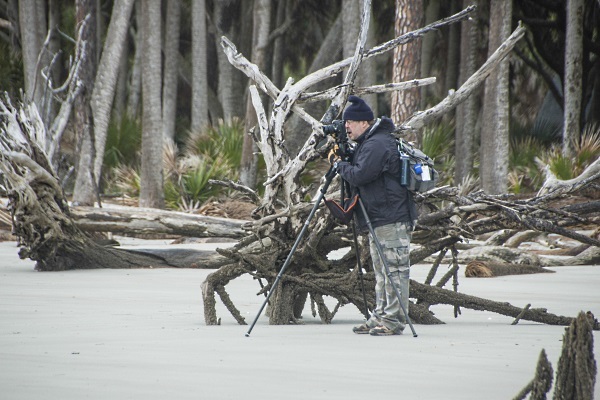 "We used to do volunteer activities here in the park," says David Price, so when we got back to the area we decided to check into doing some photo walks at beach parks and found that none of them were doing that, so we approached the park staff and said, ‘would you like us to lead some photo walks for you?' and they said, ‘sure,' so here we are." David's a lifelong photo buff work grew up in a family of professional photographers, helping out shooting weddings on the weekend during high school and college. When it came time for him to choose a career, he went in a different direction, but he's always loved taking photos, just the same, he says. Price is old enough to remember quite well the pre-digital days of film and darkroom, though he has also embraced the new digital technologies that have driven a booming interest in photography. 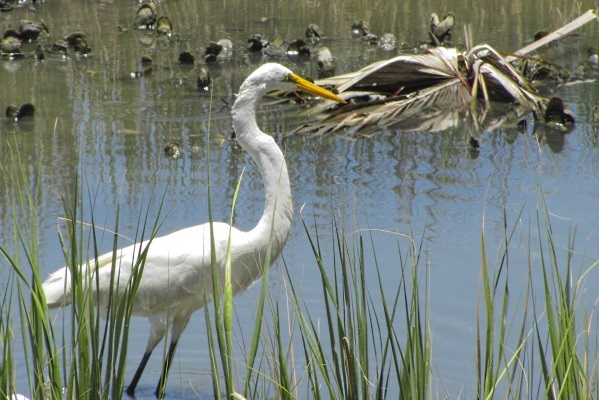 While living in California and active in a photography club there, they started an educational program of regular guided photo walks at the Cosumnes River Preserve in California's Central Valley region. 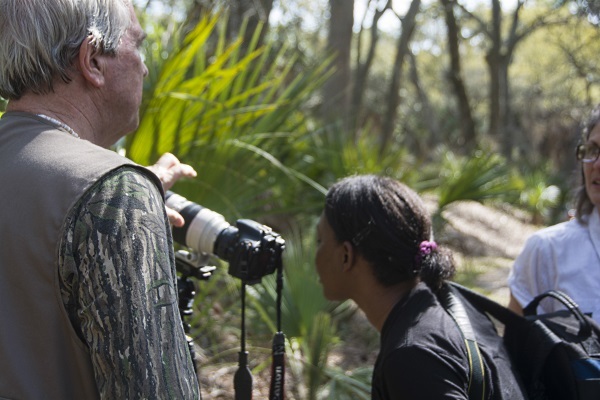 The Price's love Hunting Island State Park too, and also sharing the knowledge they have garnered from a lifetime of taking photos, so when they returned to Aiken to retire, carrying on the volunteer photo-walk effort seemed like a no brainer, perhaps helping some aspiring nature photographers polish their skills and perhaps shining a light on all HISP has to offer year-round. 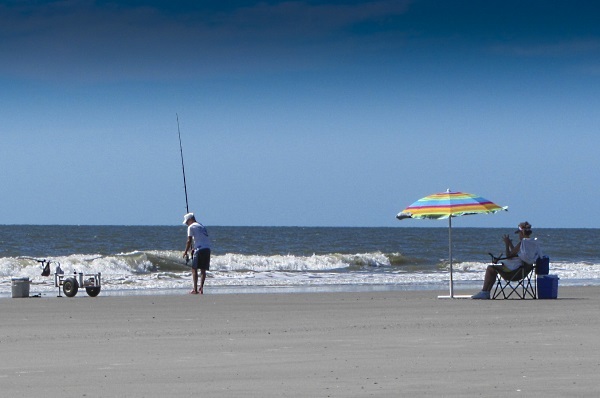 "We are hoping to help spread the word on how interesting South Carolina's beach parks are outside the summer months," says David. 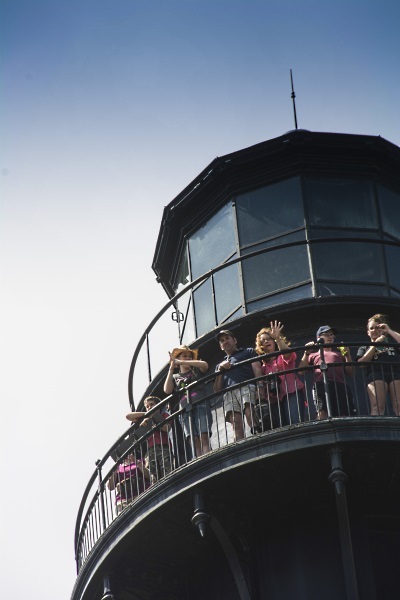 "It's been our experience that each month here brings new things to see and photograph." The concept of the walks is fairly simple. On the scheduled date, everyone who has signed up to participate in the walk meets at the park (regular paid admission is required). The groups then walks a pre-chosen path, with David in the lead, pointing out the areas that he knows are good from a photography standpoint and offering tips for various aspects of photography along the way. First wildlife spotted! 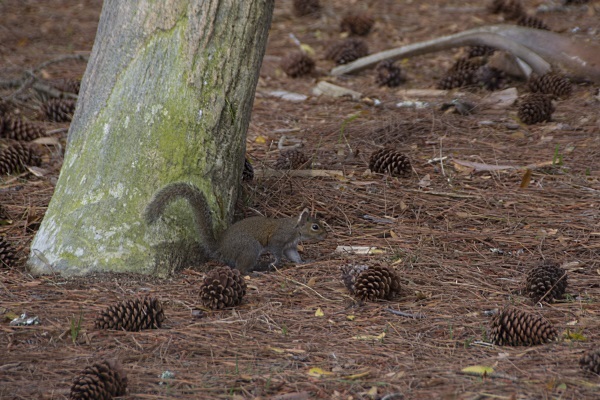 OK, so it wasn't exactly an exotic wildlife capture, but while checking my camera equipment and chatting with David and Lyn Price about their experiences leading photo walks in California and their plans for a series of (semi-) monthly excursions at Hunting island State Park, I couldn't resist taking a picture of this frisky gray squirrel hanging out at the picnic tables near the park's nature center parking lot. 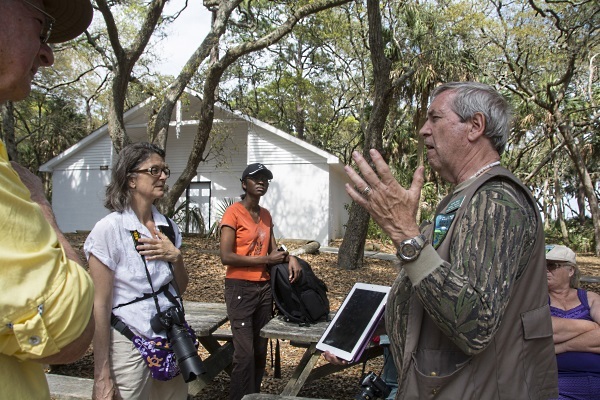 The Nature Center at Hunting Island is a great place to visit, with lots of information on display information about the natural history of the flora and fauna found within the park. It's also where folks go to access the park's fishing pier, and before our group got started down the nearby hiking trail for our morning walk, I couldn't resist trying to get a shot of this heron hanging out on the pier as early-morning anglers started arriving - I'll bet this bird is a regular visitor, too. One of our first lessons/tips from David involved trying to use interesting perspective, angles or framing to shoot relatively common objects or plants in a dramatic or otherwise interesting way. The group then split up to try our hand at it. 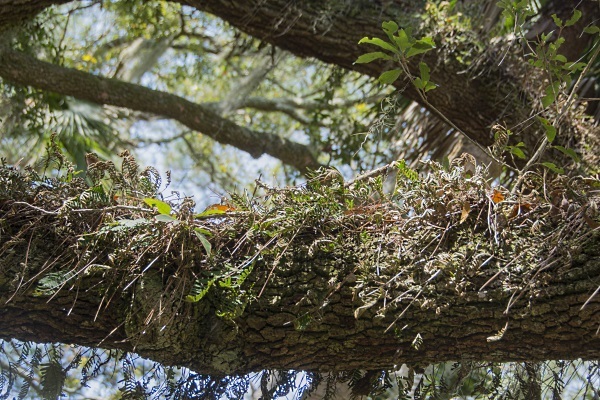 First I tried some dry resurrection fern on an overhanging live oak limb from a low angle. 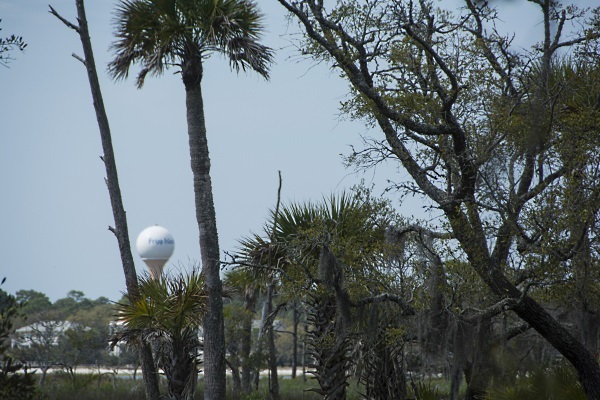 Later, I tried using the same technique to frame the very visible water tower at Fripp Island between some palms and these woodpecker cavities in a palmetto tree snag. 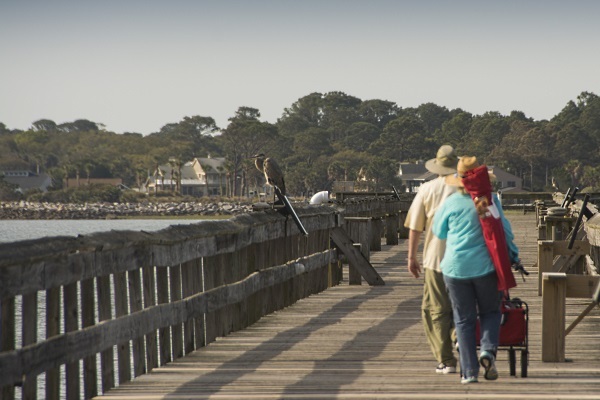 Further down the .7-mile Nature Center Scenic Trail, we crossed a pedestrian bridge over a wide creek connecting the park's lagoon to Fripp Inlet. 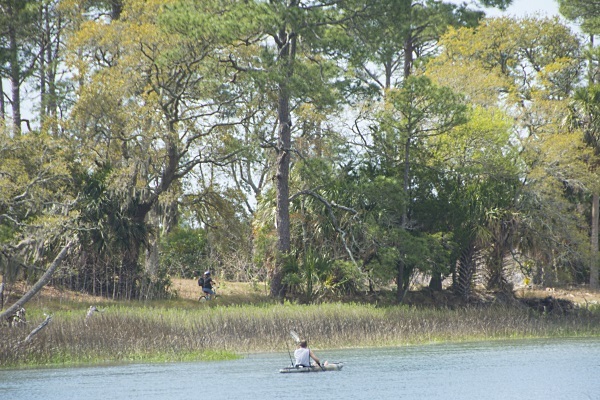 From the bridge, I was able to capture a shot of two popular activities at the park - paddling and mountain-biking - in a single frame. Other members of our group, which included folks from the Aiken photography club and some local residents from the Beaufort area, stayed busy taking photos as well. 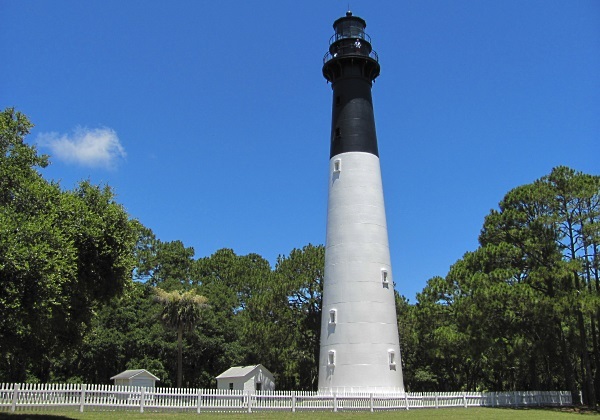 During the afternoon of our April visit, after a break for lunch during which we were free to explore the park some more own our own, we regrouped in the welcome shade of a picnic shelter at the park's iconic landmark, the Hunting Island Lighthouse, for another guided walk. 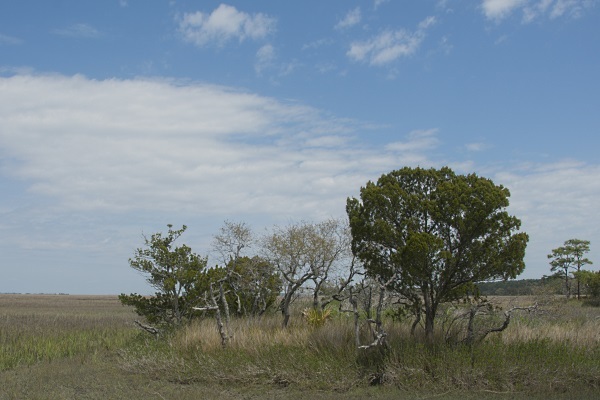 The .4-mile-long Lighthouse Nature Trail threads its way through some interesting maritime forest before ending on the beach. 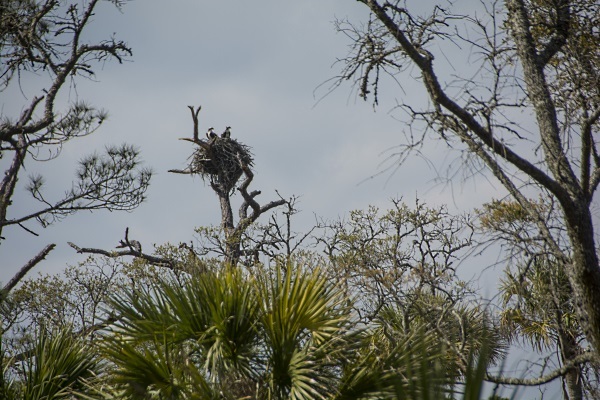 Along the way, we had the opportunity to photograph an osprey nest from the trail's edge. 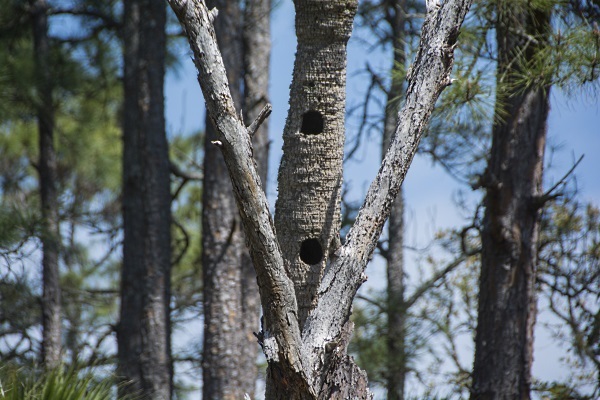 Now that I know where this pair hangs out, next time I'll be sure and bring a more powerful lens for a close-up shot! David Price is a fan of "macro," or up-close photography, for which a tripod to hold the camera as still as possible is a necessity. 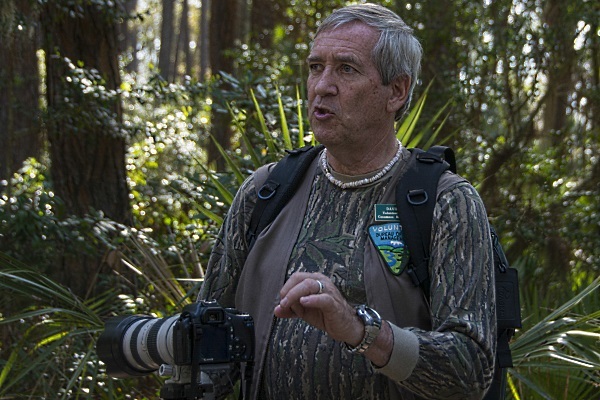 In fact, says Price, learning to take advantage of the stability offered by shooting from a tripod is a key to successful wildlife photography in general. 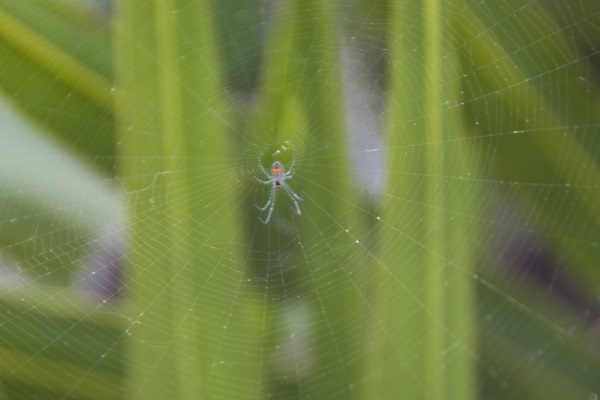 After some basic instruction, the group fanned out to look for their own macro subjects - I found this odd translucent spider with a neon orange spot spinning a delicate web between two palm fronds. A few other pictures I took during my trip to Hunting Island while trying to remember all the tips and instructions offered by David Price during our walk included an egret looking for lunch in a small pond, dwarf cedar trees sculpted by the wing from the long boardwalk that goes into the saltmarsh on the western side of Highway 21, dogs and their owners frolicking in the surf while a kayak angler passes by and a shot of this kayak in the parking lot that (maybe) looks a little like its floating through the trees. On the importance of visualizing your subject - "Every time you take a photograph, you need to have a clear picture in your mind of what your subject is, because if you don't know specifically what the subject is, your viewer won't know either, so that's extremely important." "Try simplifying your picture (and emphasizing the subject) by getting rid of everything in the background or on the sides that doesn't help tell the story of your subject," he adds. "You can't do that for all your pictures - and it's not appropriate for every picture - but, you want to simplify as much as possible." On a Saturday in early November, I again got up at dawn and made the drive down from Columbia to meet up with the Prices and walk the beach and nature trails of HISP, this time with a larger group consisting of members of both the Aiken and Atlanta-area photo clubs. The typical South Carolina autumn weather had been mild all week, but the polar vortex apparently had other ideas. 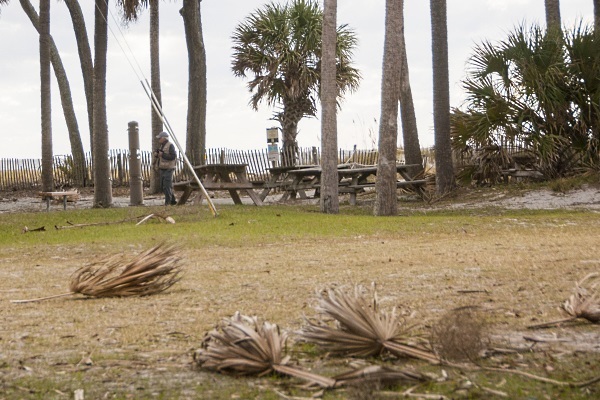 An early season blow brought wind, cold and even some light showers to the Lowcountry on the appointed day. Despite the weather, a hearty band of twenty-five or more folks showed up at the picnic shelter by the lighthouse to hear David's orientation. Palm fronds and other detritus from the storm the night before littered the ground in every direction, and with the wind still blowing briskly off the ocean, we headed down the lighthouse trail and, eventually, out onto the “boneyard” beach, where erosion has littered the sand with the trunks and roots of large trees. My fellow trippers, I won't lie. It was cold and it was windy. Honestly, not the greatest conditions for photography. But! It was also nonetheless a really great time. 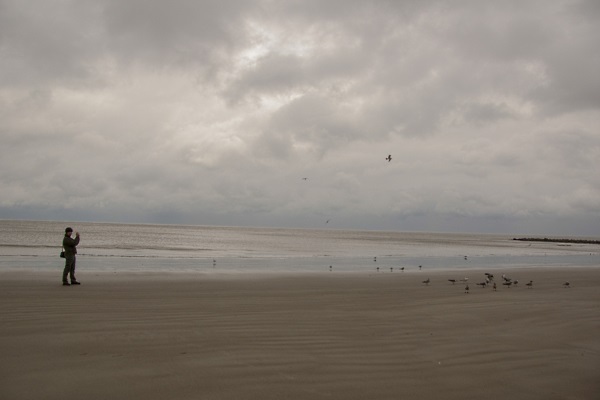 The beach in winter has a strange beauty all its own – shorn of the crowds, no sounds but the wind, and the eerie light of the rising sun trying desperately to poke through the clouds made for a really interesting backdrop. Most of my companions focused their attention on the wonderful driftwood shapes on that part of the beach, and I spent some time taking pictures of them as well, trying to incorporate David's advice of singling out the subject of the shot by using a shorter depth of field to blur the background. 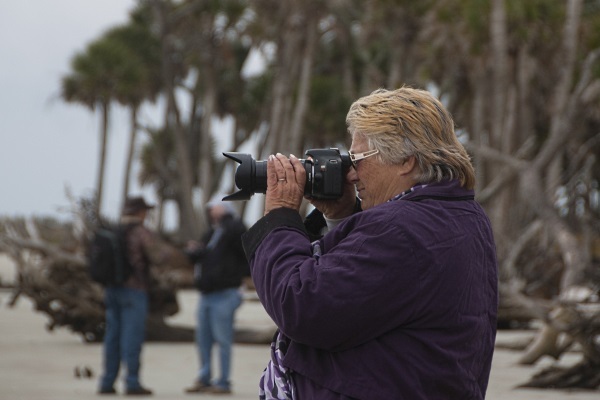 I got a nice shot of Lyn working on her own photos, while David offered some advice to another member of the group in the background. 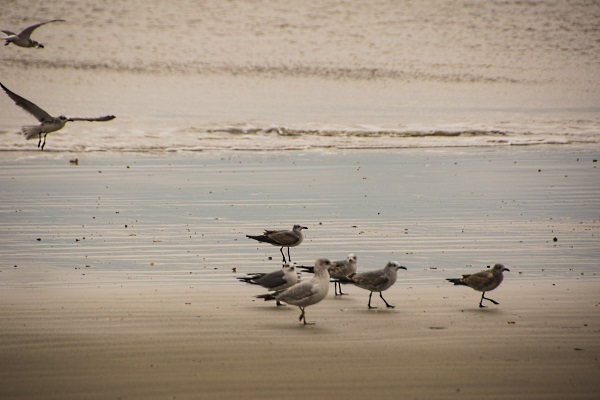 I also found that seagulls on a wintery day are pretty photogenic and don't mind hamming it up for the camera. 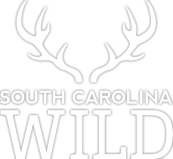 If you're interested in outdoor photography and would like to get an insider's look at some of the best places to shoot at one of our most popular state parks, you may want to check out this great opportunity.